In some parts of the world, trained monkeys are used to harvest coconuts. Because of all the lime juice they would drink, British sea men were called limeys. Mangoes belong to the same family of plant as poison ivy. Passion fruit is sweetest when slightly wrinkled. Pear trees are able to withstand temperatures as low as -40 degrees Celsius. Passion fruit were first grown in Brazil. Oranges are the most commonly grown tree fruit in the world. You can rub the inside of a banana skin on mosquito bites to stop the itchiness. The passion fruit flower is the national fruit of Paraguay. There are 10,000 varieties of apples grown around the world. People allergic to latex are highly likely to also be allergic to kiwi fruity. The coconut palm is sometimes called the “tree of life”. Tomatoes are not a vegetable, they are a fruit. They were once considered a type of apple by France and Italy and used to be yellow, not orange or red. If you plant a single orange seed you will probably get more than one plant. In Kerala in South India, coconut flowers must be present during a marriage ceremony. 25% of an apples volume is air, that’s why they float. Kiwi fruit contains actinidin which can be used to tenderize meat. The largest watermelon ever grown was 262 pounds, or 119 KG. Bananas are known for potassium, but potassium is actually found in good quantities in most fruits and vegetables. The avocado has more than double the amount of potassium than a banana. Bananas are high in the B-complex vitamins, which help calm the nervous system. Add half a cup of lemon juice to your laundry to brighten whites. Over 60 million tons of apples are grown worldwide annually. 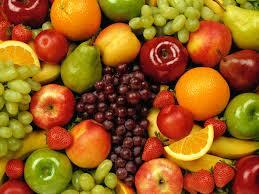 Fruit consists largely of water, just like the human body. Fruit is 100% bad-cholesterol free. There are over 1,000 different kinds of apples and none of them are native to America. Strawberries are the only fruit in the world that grow seeds on the outside and they’re related to the rose family. Pear trees can grow up to a whopping 60 feet tall and can be over 300 years old. There are over 100 different kinds of bananas and not all of them are yellow. Some varieties are actually red. Olives are actually fruits and their trees can be old – really old – standing tall for more than 1,500 years. Apples are made of 25% water, allowing them to float. Pears ripen from the inside out – and are the only fruit to do so. Eggplants are actually a fruit. You can grow a pineapple by twisting the crown off a store-bought pineapple, allowing it to air dry for a few days, and then planting it. If you plant a single orange seed, you’ll probably get more than one plant from it. Mangos are known as “the King of Fruit” throughout most of the world. People were pretty serious about playing catch in ancient Greece. If a boy tossed an apple at a girl it was seen as a marriage proposal. If she caught it, she accepted. Most raspberries are red, but some are actually white, yellow, or black. Kiwi fruits are actually berries and grow like grapes on vines that can be up to 6 feet tall. Grapes don’t always grow in perfect bunches like the ones at the grocery store. They can actually group together in clusters that range from 6 to 300 grapes. Bananas don’t grow on trees. They grow on plants that are as big as trees (they’re usually over 30 feet tall). Fruit has lots of fibre. Fruit makes you feel better. Bananas can help fight depression, as they increase levels of serotonin. Early explorers used watermelons as canteens to carry their water supplies.